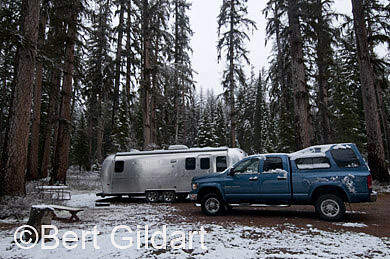 ©Bert Gildart: Last week Janie and I parked our Airstream at Seeley Lake while attending the annual convention of the Northwest Outdoor Writer’s Association of America (NOWA). The conference was held at the Double Arrow Resort, a beautiful facility just a few miles south of our quiet mountain camp. During our three-day convention we took advantage of field trips, and seminars, and we visited with a number of members with whom we’ve become good friends. Because of harsh weather, many of the events were cancelled, but Janie and I managed to squeeze in a trip to the Blackfoot Clearwater Wildlife Management Range. Biologist Tom Toman served as an excellent guide, rehashing the history of wildlife in North America. He said the antelope is one of the few “game” mammals that actually evolved here. Black bears, he said, evolved in Asia and then crossed the Baring Land Mass about 200,000 years ago. He said that elk and grizzlies are relative new comers, having arrived here 20,000 years ago. Despite the timing, both species of bears evolved from a common stock known as Ursus etruscus. Those ancient forerunners that happened to wind up in the forests learned to climb trees and so came to have more passive temperaments, characterized by today’s black bear. 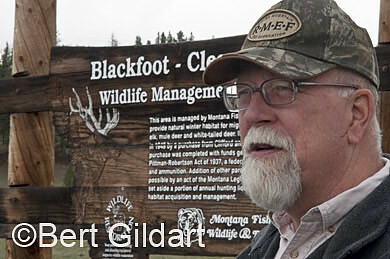 Tom Toman discusses history of elk managment Blackfoot/Clearwater area. Those that wound up in the prairies and plains of Asia had to protect their young by being aggressive. Obviously the ones that were the strongest — and most aggressive — ruled the day, and survived to perpetuate their own. Eventually, they became the mighty grizzly bear. Regarding seminars, the NOWA convention offered many to include talks on book publishing, magazine writing and photography. 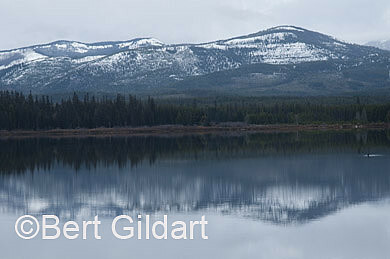 Tim Christie, a college instructor from the University of North Idaho, said the Lightroom program was his most useful program, agreeing with two other good friends, Todd Campbell of Boise, Idaho (embedded in story about bears), and Rich Charpentier of Prescott, Arizona. Both these men are excellent photographers. Also attending the NOWA convention were several sponsors. Jack Rich, a local area outfitter, claimed the distinction of early-day Montana ancestry, and in his case, an ancestor of much distinction. Tom’s great uncle, a Mr. Donne, was a member of the Washburn/Langford/Donne expedition of 1870 which explored an massive section of land just south of Bozeman, Montana. The region was rich with wildlife and all these critters were backdropped by incredible hot springs and immense geysers. Expedition members were so enamored that after nine months of exploration decided that this particular region should not be commercialized but rather be set aside for the enjoyment of all Americans. Image how such a suggestion would be received today! Two years later, this section of Wyoming and Montana was set aside as the world’s first national park, now known as Yellowstone National Park. Weather wise, the spirits worked against us; still the rain and snow combination broke up soon enough for most conference attendees to return home accompanied by favorable weather. Some had hundreds of miles to travel, but for us, the drive was short. Seventy miles later we were back home, and our timing was good, for immediately upon our return snow commenced falling once again and really hasn’t stopped. But there’s a flip side, and that is that the mountains now glow and have a primordial look that reminds us why we continue to make Montana our sanctuary, our home when we’re not traveling. This entry was posted on Thursday, May 6th, 2010 at 7:38 am and is filed under RV Travel, View Point. You can follow any responses to this entry through the RSS 2.0 feed. You can leave a response, or trackback from your own site.